﻿ MIRROR SWORD AND SHADOW PRINCE « Haikasoru: Space Opera. Dark Fantasy. Hard Science. MIRROR SWORD AND SHADOW PRINCE printing error erratum. 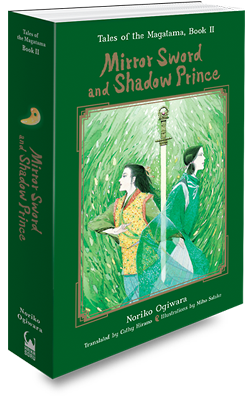 MIRROR SWORD AND SHADOW PRINCE—the giveaway! Noriko Ogiwara was inspired to write by the classic Western children's books she read as she was growing up. Mirror Sword and Shadow Prince is the second volume of the award-winning Magatama Trilogy. Her other books include The Good Witch of the West, Fuujin Hisho, the first Tale of the Magatama—Dragon Sword and Wind Child. Ogiwara makes her home in Japan. Stay with me. You need not fret. Surely you know that there has never been a time when I did not think of you. Toko gripped Oguna harder. She could feel that he was struggling to remain detached. Let the girl go. The voice suddenly sounded harsh. She’ll be the ruin of you. She’s detestable. Which one of us is really detestable, Toko thought. Despite her terror, she felt anger swelling inside her.